The Husky DP 3-in-1 Flooring Nailer and Stapler is great for the professional and homeowner alike. This nailer is easy to operate and conveniently shoots all three types of flooring fasteners; 15-1/2-gauge flooring staples, 16-gauge T-Cleats, and 16-gauge L-Cleats ranging in size from 1-1/2 Inch to 2 Inches long. The nailer has a long handle that provides a more comfortable use and the 2 interchangeable base plates allow you to install 1/2 Inch, 5/8 Inch, and 3/4 Inch tongue and groove wood flooring and protects your flooring from scratches. The Husky flooring nailer also comes with a non-marring white rubber mallet. The body of the nailer is constructed of durable die-cast aluminum to stand up to daily use, the driver blade is made of hardened steel with an aluminum cylinder and high-quality rubber O-rings. Owning your own flooring nailer over renting allows you to work at your own pace and be sure the job is done right and not rushed through. Husky 2 year limited warranty please call 888-669-5672 with questions. The Freeman 2-Piece Trim Nailer Combo Kit with Canvas Bag includes the Freeman 2 Inch Brad Nailer and the 23-Gauge 1 Inch Micro Pinner. The Brad nailer is equipped with a quick-jam release, 360-degree adjustable exhaust, anodized aluminum cylinder and rail, no-mar tip, Teflon O-ring, air filter/anti-dust cap and much more. To complete the kit and when working on the fine details of your woodwork, the Freeman PPPBRCK includes a pin nailer which leaves an almost invisible mark when inserting fasteners onto the work-piece. Also, this kit includes 1000 fasteners for both the brad nailer and pin nailer they are held inside a canvas bag for your everyday working needs. Freeman products are manufactured under strict guidelines with the professional in mind and the do-it-yourselfer alike. 3-in-1 16-Gauge Flooring Nailer and Stapler The Husky DP 3-in-1 Flooring Nailer and Stapler is great for the professional and homeowner alike. This nailer is easy to operate and conveniently shoots all three types of flooring fasteners; 15-1/2-gauge flooring staples, 16-gauge T-Cleats, and 16-gauge L-Cleats ranging in size from 1-1/2 Inch to 2 Inches long. The nailer has a long handle that provides a more comfortable use and the 2 interchangeable base plates allow you to install 1/2 Inch, 5/8 Inch, and 3/4 Inch tongue and groove wood flooring and protects your flooring from scratches. 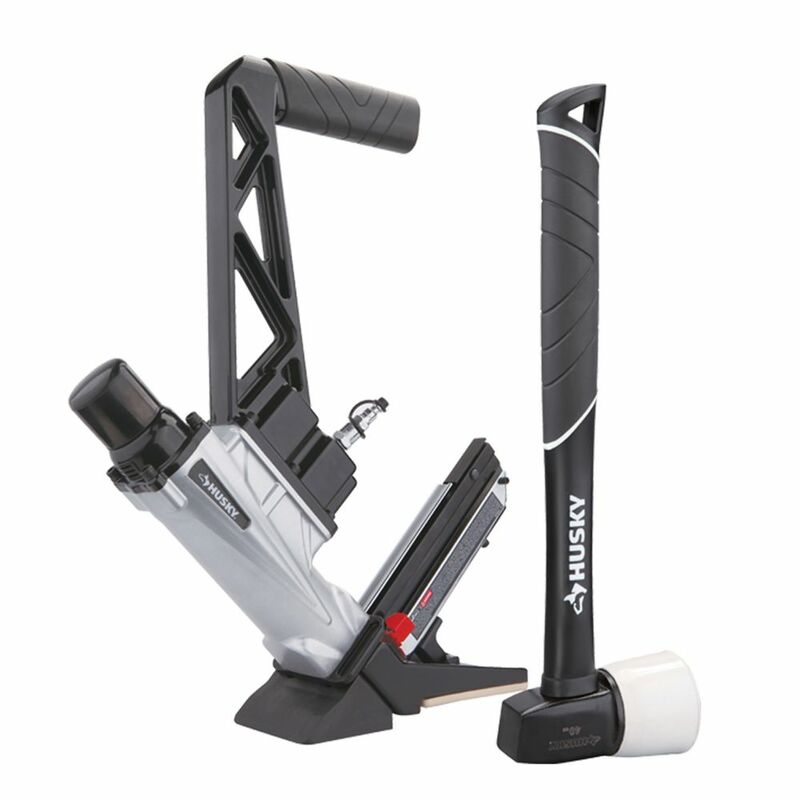 The Husky flooring nailer also comes with a non-marring white rubber mallet. The body of the nailer is constructed of durable die-cast aluminum to stand up to daily use, the driver blade is made of hardened steel with an aluminum cylinder and high-quality rubber O-rings. Owning your own flooring nailer over renting allows you to work at your own pace and be sure the job is done right and not rushed through. 3-in-1 16-Gauge Flooring Nailer and Stapler is rated 4.2 out of 5 by 84. Rated 4 out of 5 by anderson from not one jam on it's first job. ran 2000 staples just fine. so far so good. not one jam on it's first job. ran 2000 staples just fine. so far so good. Rated 3 out of 5 by Orph from We bought this only a couple days ago. It was working great until today. The quick release keeps ... We bought this only a couple days ago. It was working great until today. The quick release keeps coming open and the shoot for the nails is loose causing it to wable around. I just put a new set of nails in and now it won’t work at all. For the price I paid it shouldn’t be doing this. I will be taking it back. Rated 3 out of 5 by Jim from did about 500 square feet of a 1400 square foot project. Jammed one too many times and damaged th... did about 500 square feet of a 1400 square foot project. Jammed one too many times and damaged the striker blade that shoots the nail, and now it does not work. Unfortunately, this is the only model HD keep in stock locally and we couldn't wait 2 days to get a better one delivered, so we bought a second one.